The 2019 GMC Yukon is definitely a vehicle that you’ll want to check out in the near future. If you don’t fall in love with it due to its’ luxurious features and capabilities, you’ll definitely love the power under the hood. The 2019 GMC Yukon as something for everyone, and is sure to be a crowd favorite. Whether you’re someone who’s looking for a vehicle for the family, or is simply looking for a vehicle that has more space to transport items with you, you’ll love what the 2019 GMC Yukon has to offer. It has a powerful and versatile engine that will exceed your expectations. The 6.2L EcoTec3 V8 Engine is definitely a major perk of driving this vehicle. Additionally, it has a 10-speed automatic transmission and Magnetic Ride Control features. You’re going to be pleasantly surprised by the sheer number of capabilities and features that come standard on the 2019 GMC Yukon. Even if you’re not someone who typically likes to drive powerful vehicles, you’re going to love how the Yukon handles the roads. If you’re looking for a vehicle that will push the limits, the 2019 GMC Yukon is the vehicle for you. If you’re looking for a vehicle that happily marries power and luxury, look no further than the 2019 GMC Yukon. This vehicle has features such as Keyless Open and Keyless Start, in addition to a luxurious heated steering wheel. 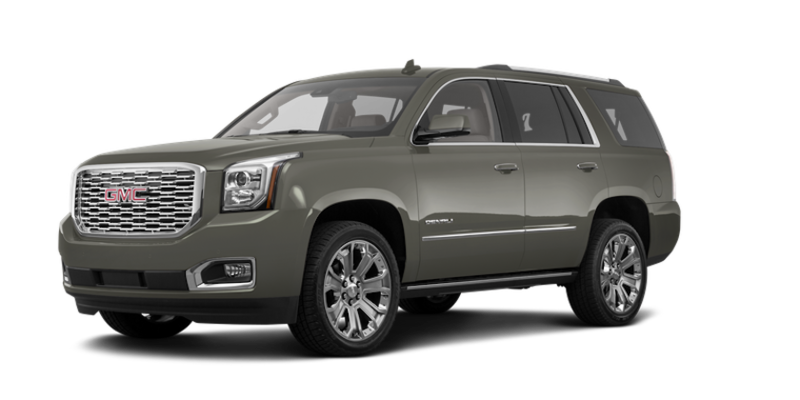 There are a number of similar features that will make driving your new Yukon your new favorite hobby. Another extremely desirable feature that is included standard on the 2019 GMC Yukon is the wireless charging capabilities. This allows you to easily charge your phone, without worrying about messing with the charging cables. This is just one of the many ways that the 2019 GMC Yukon has revolutionized what it means to be a driver and a passenger forever. If you want to become part of the revolution, it’s time to test drive one today. If you’re interested in driving a vehicle that is safe and reliable, you’re going to love what the 2019 GMC Yukon has to offer. For example, should an emergency situation ever occur, you can easily request emergency help with OnStar and the GMC Connected Services options. Without them, you may end up at the mercy of other drivers. Furthermore, there are several features that are included in the standard base model of the 2019 GMC Yukon that keep you safe on the road and especially on the highways. One of the greatest features included in the 2019 GMC Yukon is the Lane Change Alert with Side Blind Zone Alert. This will ensure that you are safely changing lanes on the highway and that you’re not going to inadvertently endanger other drivers. Keep yourself and others safe on the roads with the 2019 GMC Yukon. You’ll be glad that you did. There are countless ways that the 2019 GMC Yukon makes driving fun and exciting, in addition to being safe and reliable. If you are looking for a vehicle that includes all of the mechanical features that will keep you safe and will help you to conquer the roads, you’re going to want to see what the 2019 GMC Yukon has to offer. Although power isn’t typically at the top of most customer’s lists when it comes to buying a vehicle, it’s an important aspect to consider. Although it’s not as important as the MSRP or the safety features, it’s still valuable information to know and understand prior to investing in a vehicle. If you’re looking to purchase a vehicle, you’re going to want to know that your vehicle is going to be able to handle any situation that is thrown its way. The 2019 GMC Yukon will be able to handle most situations with ease due to its powerful engine and parts. If you haven’t yet, it’s time to see what the 2019 GMC Yukon is all about. If you want to know what it’s like to live a lavish lifestyle, you can do so with the 2019 GMC Yukon. The Keyless Open and Keyless Start features are excellent for those with busy lifestyles who don’t have time to fumble around for their keys. Furthermore, the active noise cancellation feature ensures that you have a one-of-a-kind driving experience. However, one of the greatest aspects of this vehicle is the fact that you can have all of the most desirable features without paying an arm and a leg to own it. If you don’t have the money for an outrageous monthly payment, however, you still want the features that are luxurious and versatile, you’re going to love the 2019 GMC Yukon. These features are excellent for anyone, regardless of how long they have been driving. However, these features are especially helpful for new drivers as they learn to navigate the busy roads. The Rear Vision Camera will alert drivers to potential hazards while backing out of a parking space or a driveway. This is especially important on larger vehicles such as the 2019 GMC Yukon. Furthermore, if you’re looking for a vehicle that will keep you and your loved ones safe on the dangerous roads, you’ll love the features such as Lane Keep Assist with Lane Departure Warning. This feature will provide you with an alert each time you begin to drift out of a lane on the highway or street. This will ensure that you are safe and aware to the dangers of the road prior to a potential incident. The 2019 GMC Yukon has a plethora of safety features that will be sure to excite and entice you. If you’re interested in driving safer, you’re going to want to check out the 2019 GMC Yukon. Carl Black Kennesaw is the place to shop for your next vehicle. We have all of the vehicles that you’re interested in, listed at competitive prices. Whether you’re ready to buy today or just beginning the process, Carl Black Kennesaw will help you with all of your car-buying needs. If you’re looking for a dealership that puts an emphasis on the customer and truly values the fact that they provide exemplary customer service, you’re going to love Carl Black Kennesaw. The team is comprised of highly-skilled and highly-qualified professionals who are ready to assist you with every step of the process. We pride themselves on providing exemplary customer service every day with every customer. Furthermore, we work to provide all of the makes and models that you’re looking for at the absolute lowest prices. If you’re looking for a new vehicle, and you’re local to the Kennesaw area, it’s imperative that you see what Carl Black Kennesaw can do for you. After shopping with Carl Black Kennesaw, you’ll begin to wonder how you ever shopped with another dealership. If you want the best prices, on the best inventory, and the absolute best customer service… there’s only one place to shop: Carl Black Kennesaw.